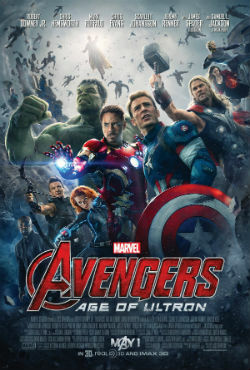 The first Avengers film pulled off the impressive feat of bringing together Marvel’s greatest superheroes in one film, including Iron Man, Captain America, Thor, Hulk, Black Widow and Hawkeye, while still managing to retain a consistent plot and enough screen time to stroke each of their egos. Joss Whedon returns to direct the second outing, which achieves the even greater challenge of being better than the original. This film is bigger and better in every aspect. We are introduced to a whole new roster of superheroes, the biggest of which are gifted siblings Quicksilver (who can move at the speed of light) and Scarlet Witch (who can read minds and move objects telekinetically). There’s also The Vision, a synthetic humanoid who can fly, among other things. The Vision is the brain-child of Tony Stark (a.k.a Iron Man), which would be a huge achievement if it wasn’t the bi-product of his first attempt to create artificial intelligence – in the form of big, bad robot Ultron. Ultron (spectacularly voiced by James Spader) has some serious daddy issues and wants nothing more than to wipe out life on the planet. As is expected with any Marvel film, there’s a perfect balance between serious action and a few chuckles. Watching The Avengers turn on one another is just as fun as watching them kick some serious but together as a team, especially when we finally get to see Hulk vs. Iron Man in one of the greatest on-screen fights in history. All in all, Avengers: Age of Ultron is not only one of the best films of the year, but one of the best superhero films ever made. It’s definitely worth one, if not multiple viewings.